Marangu is a popular choice among Kilimajaro climbers due to the misconception that it is the easiest route. It is not. 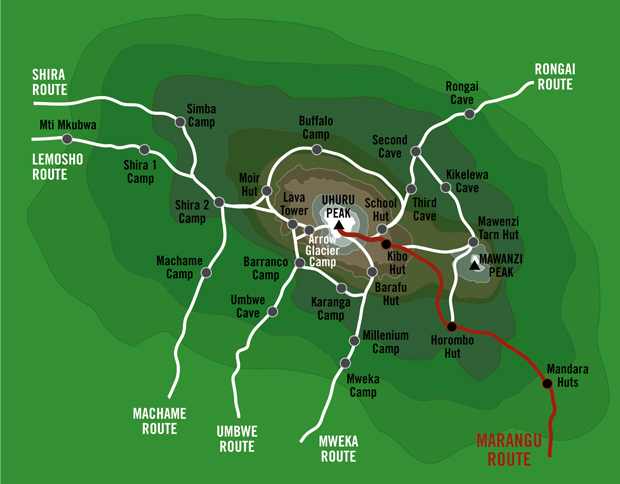 It is true that Marangu is the shortest route in terms of time needed to climb, 5 days. And it is also accurate that you sleep in mountain huts, so no camping is required. However, altitude illness is a serious concern for this route in particular due to its short ascent. Do not climb using the 5 day Marangu route. Interestingly enough, Kilimanjaro operators do not due their job in advising clients to consider alternative routes, or adding an extra mountain night to better ease the burden on your body. If you take the Marangu route or the Rongai route, you will notice many ill climbers on the way up and down. Marangu is known as the “Coca-Cola Route” because rangers will sell Coke and other goodies (even Kilimanjaro beer!) at the shelters. I recommend the 7 day Machame route for the most scenic route and the best acclimatization. After breakfast and a short briefing from the guide, transfer to the gates of Kilimanjaro National Park (it is a 45-minute drive from Moshi to the Marangu Gate). Upon registering with park authorities, begin the 4 hour walk to the Mandara encampment. Pass through a thick rainforest zone, where there is a high chance of rain in the afternoon. Spend the night at Mandara Hut (2743m), an attractive collection of buildings. Bathrooms are available with running water. Most days the hiking will begin early in the morning. You will hike for about 5 to 6 hours each day. The guides will take you at a moderate pace, so as to allow you time to acclimatize to the altitude changes. Your guides will continually repeat the words, “pole pole” (po-ly, po-ly), which means “go slowly” in Swahili. The lower terrain is gorgeous and fascinating, as we will pass through a thick rainforest zone, stopping at the Mandara Hut. Over the next two days you will continue your ascent to the saddle of Kilimanjaro. From up here the views are vast and beautiful. As the camps have limited activities, you should take advantage of your time on the hikes to take in all the scenery and great views. Continue the ascent through the temperate forest zone for a short time, before reaching the heather and moorland zone at roughly 3000m. Enjoy stunning views of the mountain peaks at this altitude. Spend the night at Horombo Hut (3720m), which lies in a valley surrounded by giant lobelia and groundsel, flora which are characteristic of this semi-alpine zone. Bathrooms are available with running water. Continue today past the final watering point, and ascend onto the saddle of Kilimanjaro between the peaks of Kibo and Mwenzi. Notice the vegetation thinning out and enter the desert-like alpine zone (approximately 4000m) and, after crossing the saddle, Kibo peak comes into view. The saddle is an alpine desert that resembles a lunar landscape. This walk will be taken at a slow pace, be careful to notice signs of altitude sickness. Spend the night at Kibo Hut (4703m), a comfortable stone construction (no running water at Kibo Hut). This semi-desert zone receives an annual rainfall of under 250mm; the ground often freezes at night, but the temperature soars to above 30 degrees by day. Few plants other than lichens and grasses survive in these conditions. 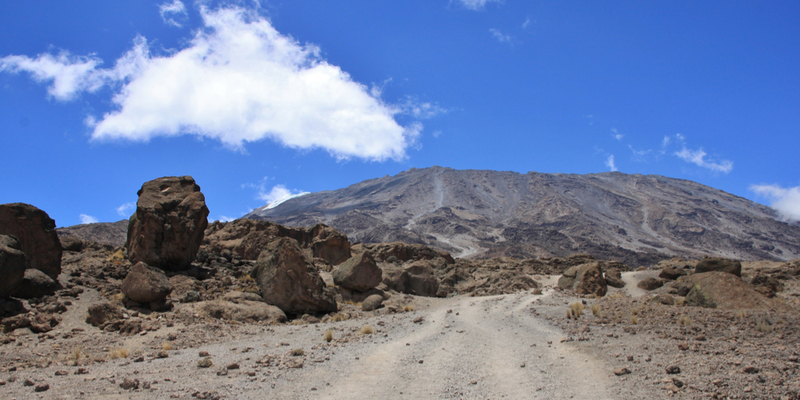 Shortly after midnight, commence the climb to the summit of Kilimanjaro, since it is easier to climb the scree slope to Gillman’s Point (5861m) on the crater rim when it is frozen. This early start improves the chances of reaching the summit in time for sunrise. From Gilman’s Point, it is a further 3 hour round trip along the crater’s edge to Uhuru Peak, the highest point in Africa. Though how high you go will depend on how you feel. Upon completion of the climb, your guide will begin your decent as quickly as possible, taking you down to Horombo Hut to spend your last night on the mountain. Continue the descent past the Mandara encampment to the bottom of the mountain where each hiker will receive a well-earned certificate. Transfer by shuttle bus to Moshi and spend the night in deserved comfort.